Bruno A. Boley (1924-2017) passed away peacefully February 11 in Providence RI. He will be missed by his son, daughter in law, granddaughter and great grandson. Bruno was born in Italy, migrated to the United States on the last sailing of the Queen Mary before the outbreak of World War II in 1939, obtained the B.S. degree in Civil Engineering from City College of New York and the Sc.D. in Aeronautical Engineering from Brooklyn Polytechnic Institute in 1946. He was a professor in Civil Engineering at Columbia University (1952-1968), headed the Cornell University Department of Theoretical and Applied Mechanics until 1972 and then was Dean of Engineering at Northwestern University until 1986. Wing Kam Liu of Northwestern University, former chair of USNC/TAM, discusses the national committee's involvement with IUTAM and its efforts to engage engineering students and early careers. Nadine Aubry of the United States was selected as the next president of IUTAM. Dr. Aubry is a current member of the USNC/TAM, and is also a Fellow of the American Physical Society (APS) and the American Society of Mechanical Engineers (ASME). She is Dean of the College of Engineering and a University Distinguished Professor at Northeastern University. The IUTAM Bureau Prize for best lecture in Solid Mechanics by a young scientist was awarded to Professor Stavros Gaitanaros. Dr. Gaitanaros is an Assistant Professor at Johns Hopkins University in Baltimore, and was recognized for his work on the effect of polydispersity on the crushing of open-cell random foams. 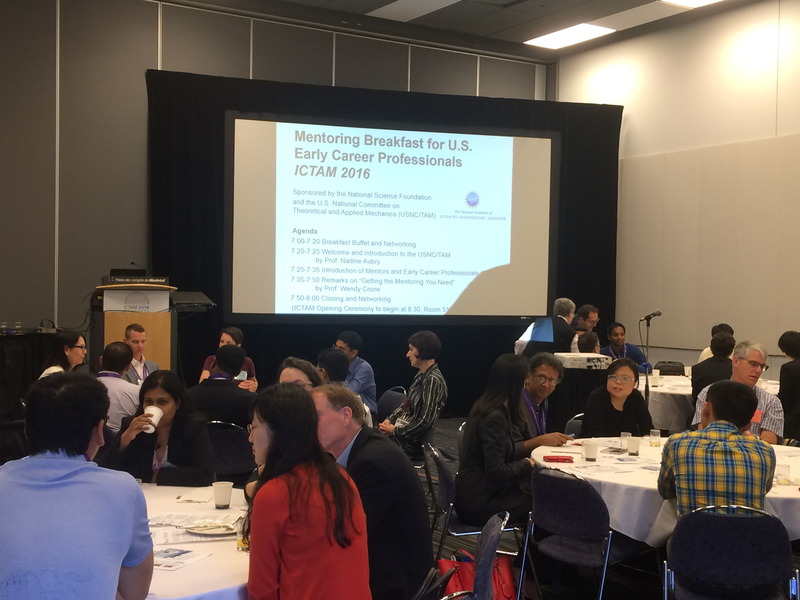 The USNC/TAM was proud to host a Mentoring Breakfast at ICTAM 2016. 46 early career professionals and mentors networked at the breakfast, during a session facilitated by USNC/TAM member Wendy Crone. The winners of 2018-2019 IUTAM Symposia were announced at ICTAM 2016. The comprehensive list of American winners can be accessed on the main USNC/TAM page. WAM2016, short for the Workshop on Predictive Theoretical, Computational, and Experimental Approaches for Additive Manufacturing (WAM 2016), was held in Dalian, China from October 17--19, 2016. The National Natural Science Foundation of China (NSFC) and the Chinese Society of Theoretical and Applied Mechanics (CSTAM) co-sponsored the event. The workshop is an extension of last October's "A Workshop on Predictive Theoretical and Computational Approaches for Additive Manufacturing" held in Washington, DC at the National Academies of Sciences, Engineering, and Medicine. Both workshops aimed to foster collaboration among professionals and undertake challenges within the field of additive manufacturing. 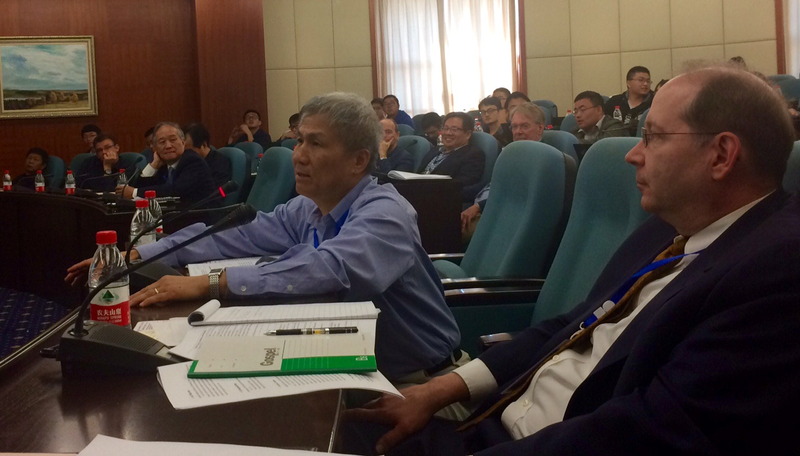 Wing Kam Liu, past USNC/TAM chair and co-chair of WAM 2016, speaking at the workshop. On April 22 and 23, the USNC/TAM held its 2016 meeting at the National Academies in Washington, D.C. Presentations from invited speakers are available for download here. If you are looking for the presentations from the 2015 USNC/TAM meeting, they are located here. The 17th U.S. National Congress on Theoretical and Applied Mechanics was held June 15-20, 2014 at Michigan State University in East Lansing, Michigan. The Congress was co-chaired by John Foss and Tom Pence. Technical sessions covered a range of topics, including fluid mechanics, solid mechanics, dynamics, vibrations, controls, biomechanics, computational mechanics, applied physics, and applied mathematics. In addition, on June 15, the USNC/TAM held its meeting. For more details, please visit the 17th U.S. National Congress on Theoretical and Applied Mechanics website. 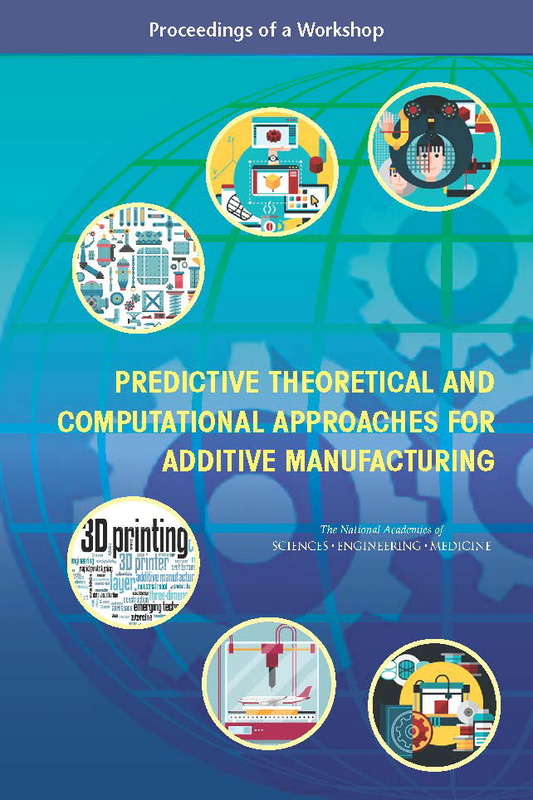 The recent USNC/TAM-hosted Workshop on Predictive Theoretical and Computational Approaches for Additive Manufacturing was a tremendous success. The three-day workshop featured 24 presentations from speakers in academia, industry, and government labs, and the Livestream workshop broadcast has already reached over 200 live and 1,700 total viewers. Workshop participants Ade Makinde (GE Global Research Center), Tahany El-Wardany (United Technologies Research Center), Peter Olmstead (Georgetown University), and Joseph Beaman (University of Texas - Austin) were happy to answer additive manufacturing questions in a video for NAS. All workshop media, including session videos, meeting agenda, and presentation PDFs, are listed on the 2015 Additive Manufacturing Workshop page. You can also click below to browse and view the eight session videos. As a result of this workshop, Lyle Levine, Project Leader of Additive Manufacturing of Metals at NIST, has proposed a series of benchmark tests and an accompanying conference series. Dr. Levine's ideas for AM-Bench are loosely based upon his existing NUMISHEET benchmark test series, which has profoundly influenced the sheet metal field for over 25 years. The project, which aims to start developing AM standards, requires input from experts across the board in industry, national labs, and academia. If you are interested in joining the planning committee, which will define the scope and organization of this series, please contact Lyle Levine at Lyle.Levine@nist.gov.